High school, archery club, and boys were the things that filled Juna's daily life. But when an accident leaves her clinging tenuously between life and death, fate intervenes as she becomes the sole witness to scenes of Earth's destruction along with humanity's reckless pollution of the sky, the Earth, and water. It is here in which Juna is given a new chance at life and bestowed the powers of the Earth, a power she must wield in order to stop an evil bent on Earth's destruction. Contains all 13 Episodes of Arjuna! 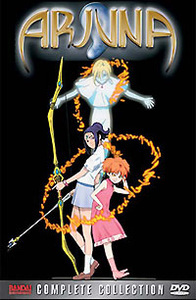 DVD Features: Special "Director's Cut Edition" with additional footage, Isolated Score dolby Digital 5.1 Audio Track, Preview Collection, Arjuna Dictionary, Cast Interviews, Preview Collection, Arjuna Dictionary, Shoji Kawamori Interview, Voice Actor Interviews, Appare Adventures, and Maaya Sakamoto "Mameshiba" Karaoke.